The difference between evil and good (klipa vs holiness) isn’t in action but only in intention. For the sake of self is evil; for the sake of others is good. Hence the transition between them is quick. So, we must pay attention to thoughts and intentions thereby correcting our states. The source of all ills is our self-love/ego, which can’t be tamed. Kabbalah offers a solution to the crisis—to rise above the ego and use it in reverse—as bestowal over reception. This option exists in Nature. We need to unlock the power of bestowal. Kabbalah explains how. Perfection from the least to the greatest is evaluated by how all sorts of negative and positive phenomena combine together as one single whole. There’s no good or bad —there’s only harmony and perfection. Man’s goal in this world is to fill desires to enjoy. His goal in the spiritual world is to perceive perfection in the will to bestow. To the extent of our efforts, the light affects us, bringing us to the desire of the upper one and the sensation of perfection in that desire. The first step into spirituality is refusing the feeling of confidence in reason, above it building an attitude to the world above reason, “for the sake of bestowal,” 2 degrees: reason and above reason. Reveal both and between them I will feel the upper world, the upper reality. Spirituality is revealed in the will to bestow. How do we check and measure it? It is written: “I saw a reverse world.” The measurement isn’t done in my heart and mind, but to the extent I come out of them, joyfully bestowing, being closer to the Creator and the new reality. Despite the fact that spiritual pleasure is infinitely greater than material pleasure, it is revealed to a person in such a measure and form that it does not attract him. Therefore, he continues to move up the ladder of his correction with great effort. It is said that the embryo, the very first spiritual state, sees the entire world from one end to the other, including the force it is filled with, and how it is controlled. He faces the universe, which is opened to him and it is all his! Then, the question arises: Afterward, does a person have the strength to extract himself from the petty, nasty egoism of our world to take a step further into abundance, perfection, and harmony? The answer is yes. Everything disappears without a trace, enabling a person to conquer the upper world anew. It also disappears to such an extent that it leaves no trace other than an informational record that he cannot use in any way. This turns into a negative stage, into a descent that he must exit. That is how spiritual development is constructed: night – day, night – day. Question: What does a person acquire in these swings? It seems that he is simply turned off or on and you can do anything you want with him. Answer: Of course. Don’t we see it in our lives? Question: Where is the person here? It is unclear. Answer: There is no person. He is not even an embryo; he just begins to enter the higher Partzuf, moving like a sperm, reaching his place within the uterus. It is quite complicated. We know from our life that conceiving a human being is complicated. Question: What does a person who is being moved through these stages add? Answer: An ever greater and greater annulment of oneself to the higher force. Question: So, a speck of memory from the perfect state still remains? Answer: No. It does not help, it does not add energy or a leap forward. The ascent takes place only due to an accumulation of efforts in the group, the full measure of which is called Seah. To become an embryo means to join the group for the first time, which for a person is like his mother’s womb. Question: In what way do you as a Kabbalist adapt yourself to the students and the group? How do you interconnect and annul yourself? Answer: And how do we adapt ourselves to newborns and children as they grow up and become more and more adult? They do not adapt to us, but we always adapt to them. They say that a small child is the head of the family because the family exists for him. Why do I need a group: for them to serve me or for me to serve them? I must raise the students to the next level. Question: Do you, as a teacher, clearly see if the group, the students, perceive you correctly? Answer: I keep my students in myself like “a hen on eggs.” I fill them, control them, keep them on a short leash, cause certain reactions, certain influences, monitor their reaction, and in accordance with this, I change myself—not them. 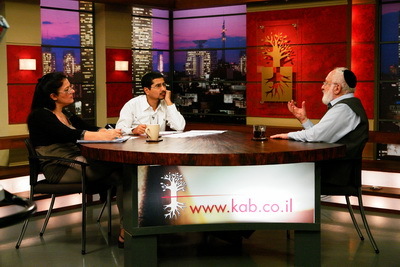 In Kabbalah, the teacher must adapt to the students more than the students do to the teacher. Question: When you hold students within you, do you keep contact with them through the Creator or are they inside your spiritual Partzuf like a child in the womb? Answer: This means in the Creator because the system called “womb” in which I carry my students is the Creator in me. Only in Him are the next souls born. What happens when a country collapses in a global world? And how does that, also, increase hatred towards Israel? 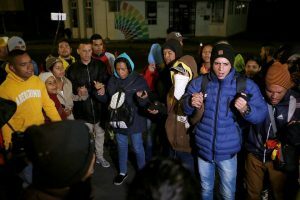 2.3 million people are fleeing Venezuela, half of whom are undernourished, as their economically depleted country faces a critical food shortage. Sadly, there is no immediate way to help the millions of suffering Venezuelans. The absurdity of our world is that there is more than enough food, clothing, and medical solutions to satisfy the basic needs of all citizens of earth, and yet, up to fifty percent of all the food produced globally is thrown to waste, while trillions of dollars are spent on global warfare. As we head into the near future, these two opposite trends will climax: on the one hand, we will witness more and more economic crises, social unrest, hunger, sickness and human suffering. And at the same time, we are entering a highly technological and hyper-connected era with robots, self-driving cars and other developments made possible by artificial intelligence. The ability to produce an abundance of everything we need everywhere will be accessible at the touch of a button. Between these two trends it will become as clear as a bell that nothing is missing in our world besides healthy and positive relations between human beings, to enable consideration, mutual concern and effective connections across all the inhabitants of earth. This will be the only way to help the billions of people who will suffer. But what will enable humans to see each other as a single, global family? History shows that the love of power, money, and honor, the human ego, always has the upper hand. Humans seem to prefer to fight each other rather than embrace each other. This appears to be the bitter reality of our nature, and any portrayal of a global human family appears downright utopian. In order to achieve a viable and lasting positive connection between human beings, so that we can reorganize society to satisfy everyone’s basic needs, a unique method for human connection is required. Only one nation was founded on the basis of the natural, universal connection between humans. This method is what turned them into a people in the first place, and they lived by that method for a while. But when they abandoned the method, they began to wander the world, and their true origin was almost completely forgotten. The Book of Zohar reveals the deeply rooted network connecting all people and all nations. Israel is a central hub within the network. However, it has forgotten how it was created in the first place and the natural role it played in the network. As these crises, such as that of Venezuela, will continue to manifest across the planet, human suffering and frustration will accumulate and be converted into hatred towards Israel. Beneath the surface, in the world’s connected subconscious, anger and resentment will inflame towards the Jewish people. When and where will anti-Semitic events erupt above the surface? No one can predict this without seeing and fully understanding the network that connects all of humanity. Social cooperation and reciprocity calm fear whereas an abundance of money does not. Financial worries can be exchanged for warmth and security when we unite and create balance between us. Social activities must be accompanied by education and interpretation. A natural life force is discovered when we unite and we gain additional energy.